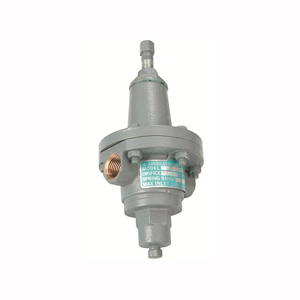 The Z and ZSC Pilot ¼" and ½" NPT regulators are designed for applications where a secondary control pressure is used to operate the main valve. They provide fast, accurate stable pressure regulation and are especially recommended for installations where large load changes occur, where large pressure reductions are required, and where there is a considerable variation in the inlet pressure. They are also used where the outlet pressure exceeds the practical limits of spring or weight loading. The ZSC Pilot can be supplied for reducing service or back pressure service. The Maximum Inlet Pressure of the ZSC Pilot Regulators is 1440 psi. Type ZSC- 100 is for reducing pressure service from 1 to 325 psi (6.8 to 2240.8 kPa). Type ZSC- 150 is for back pressure service from 1 to 325 psi (6.8 to 2240.8 kPa). Type ZSC-320- 100 is for reducing pressure service from 150 to 600 psi (1034 to 4136.8 kPa). Type ZSC- 320- 150 is for back pressure service from 150 to 600 psi (1034 to 4136.8 kPa). The Z Pilot regulator is equipped with a balanced spring to ensure tight closing, and to provide a wide range of outlet pressure adjustment. The Maximum Inlet Pressure of the Z Pilot Regulators is 1440 psi. Type Z provides outlet pressures from 1 to 325 psi (6.8 to 2240.8 kPa). Type Z-138 provides outlet pressures from 100 to 600 psi (1034 to 4136.8 kPa).